Were Hedge Funds Right About Dumping Lowe’s Companies, Inc. (LOW)? Hedge funds are known to underperform the bull markets but that’s not because they are bad at investing. Truth be told, most hedge fund managers and other smaller players within this industry are very smart and skilled investors. Of course, they may also make wrong bets in some instances, but no one knows what the future holds and how market participants will react to the bountiful news that floods in each day. Hedge funds underperform because they are hedged. The Standard and Poor’s 500 Index returned approximately 13.1% in the first 2.5 months of this year (including dividend payments). Conversely, hedge funds’ top 15 large-cap stock picks generated a return of 19.7% during the same 2.5-month period, with 93% of these stock picks outperforming the broader market benchmark. An average long/short hedge fund returned only 5% due to the hedges they implement and the large fees they charge. Our research covering the last 18 years indicates that investors can outperform the market by imitating hedge funds’ stock picks rather than directly investing in hedge funds. That’s why we believe it isn’t a waste of time to check out hedge fund sentiment before you invest in a stock like Lowe’s Companies, Inc. (NYSE:LOW). Is Lowe’s Companies, Inc. (NYSE:LOW) a buy, sell, or hold? Investors who are in the know are becoming less hopeful. The number of bullish hedge fund positions went down by 4 in recent months. Our calculations also showed that LOW isn’t among the 30 most popular stocks among hedge funds. If you’d ask most traders, hedge funds are seen as worthless, outdated financial tools of the past. While there are over 8000 funds trading at present, Our experts hone in on the crème de la crème of this group, approximately 750 funds. These money managers manage the majority of the smart money’s total capital, and by tailing their highest performing stock picks, Insider Monkey has figured out several investment strategies that have historically outrun the S&P 500 index. Insider Monkey’s flagship hedge fund strategy outrun the S&P 500 index by nearly 5 percentage points annually since its inception in May 2014 through early November 2018. We were able to generate large returns even by identifying short candidates. Our portfolio of short stocks lost 27.5% since February 2017 (through March 12th) even though the market was up nearly 25% during the same period. We just shared a list of 6 short targets in our latest quarterly update and they are already down an average of 6% in less than a month. We’re going to take a look at the key hedge fund action encompassing Lowe’s Companies, Inc. (NYSE:LOW). How are hedge funds trading Lowe’s Companies, Inc. (NYSE:LOW)? At the end of the fourth quarter, a total of 53 of the hedge funds tracked by Insider Monkey were bullish on this stock, a change of -7% from one quarter earlier. 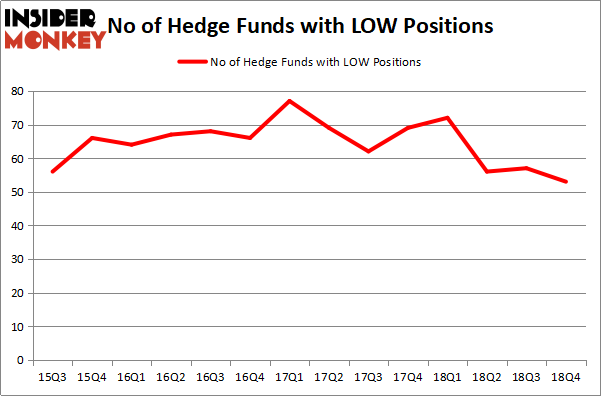 The graph below displays the number of hedge funds with bullish position in LOW over the last 14 quarters. With hedge funds’ sentiment swirling, there exists an “upper tier” of notable hedge fund managers who were increasing their holdings significantly (or already accumulated large positions). More specifically, Pershing Square was the largest shareholder of Lowe’s Companies, Inc. (NYSE:LOW), with a stake worth $880.8 million reported as of the end of September. 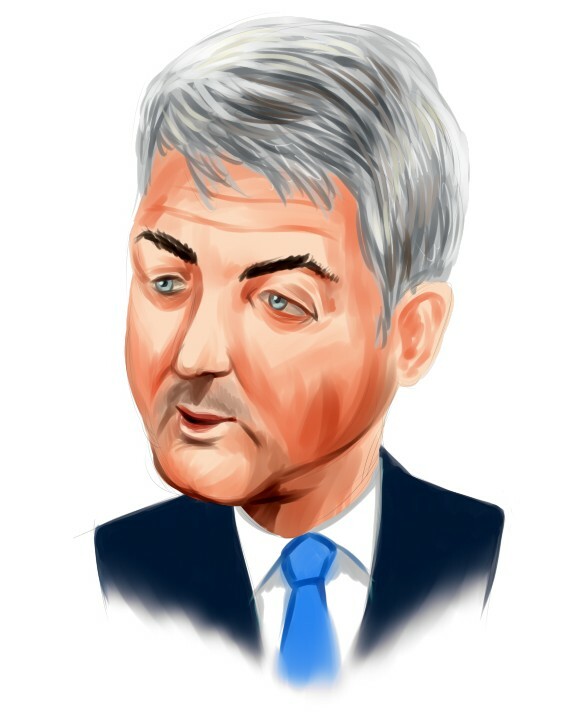 Trailing Pershing Square was D E Shaw, which amassed a stake valued at $817.7 million. AQR Capital Management, Millennium Management, and OZ Management were also very fond of the stock, giving the stock large weights in their portfolios. Judging by the fact that Lowe’s Companies, Inc. (NYSE:LOW) has faced declining sentiment from the aggregate hedge fund industry, it’s safe to say that there exists a select few fund managers that decided to sell off their full holdings in the third quarter. At the top of the heap, Brandon Haley’s Holocene Advisors said goodbye to the biggest stake of all the hedgies tracked by Insider Monkey, comprising an estimated $209.4 million in stock. Howard Guberman’s fund, Gruss Asset Management, also dropped its stock, about $36.7 million worth. These transactions are important to note, as aggregate hedge fund interest was cut by 4 funds in the third quarter. Let’s now take a look at hedge fund activity in other stocks – not necessarily in the same industry as Lowe’s Companies, Inc. (NYSE:LOW) but similarly valued. We will take a look at U.S. Bancorp (NYSE:USB), British American Tobacco plc (NYSEAMEX:BTI), Banco Santander, S.A. (NYSE:SAN), and CIGNA Corporation (NYSE:CI). All of these stocks’ market caps are closest to LOW’s market cap. As you can see these stocks had an average of 34.25 hedge funds with bullish positions and the average amount invested in these stocks was $2996 million. That figure was $4173 million in LOW’s case. CIGNA Corporation (NYSE:CI) is the most popular stock in this table. On the other hand British American Tobacco plc (NYSEAMEX:BTI) is the least popular one with only 10 bullish hedge fund positions. Lowe’s Companies, Inc. (NYSE:LOW) is not the most popular stock in this group but hedge fund interest is still above average. This is a slightly positive signal but we’d rather spend our time researching stocks that hedge funds are piling on. As we said earlier top 15 most popular stocks among hedge funds returned 19.7% through March 15th and outperformed the S&P 500 ETF (SPY) by 6.6 percentage points. Unfortunately LOW wasn’t in this group. Hedge funds that bet on LOW were disappointed as the stock returned 9.0% and underperformed the market. If you are interested in investing in large cap stocks, you should check out the top 15 hedge fund stocks as 13 of these outperformed the market. Were Hedge Funds Right About Dumping Twenty-First Century Fox Inc (FOX)? Were Hedge Funds Right About Buying Costco Wholesale Corporation (COST)? Do Hedge Funds Love Diageo plc (DEO)? Hedge Funds Have Never Been This Bullish On Thermo Fisher Scientific Inc. (... Itau Unibanco Holding SA (ITUB): Are Hedge Funds Right About This Stock? Were Hedge Funds Right About Buying United Technologies Corporation (UTX)?